Losing weight and looking like supermodel Tyra Banks is everyone’s dream. Unfortunately, weight loss is a costly process. You will have a major headache each time a bill from the health club or weight loss clinic arrives in your mailbox. Further, not many diet plans and exercises work well. Fortunately, there are other alternatives to prescription diets. Weight watchers have turned to Ayurvedic medicine, an attractive dieting alternative. It includes a host of easy-to-prepare, natural remedies. They complement other weight loss methods, such as diet shakes by Ideal Shape. Ayurvedic medicine is a system of medicine with roots in India. It is a traditional, alternative therapy that goes with existing medical treatments. Practitioners have included it in many wellness applications. Proponents of these natural treatments believe that there are connections between everything in the universe. They base treatments on the five elements of Earth, Fire, Air, Water, and Space. They combine to form three life forces Vata Dosha (space and air), Kapha Dosha (water and earth) and Pitta Dosha ( Fire and Water). Everyone has a unique combination of these elements. The doshas control physical functions, and you become unwell when they are out of sync. Vata Dosha controls essential bodily functions. It determines breathing, heart function, and blood flow. How well you digest food depends on how strong it is. You may encounter problems with your digestive system if this is your life force. Then, there is Pitta Dosha, which determines your metabolism. This dosha also controls appetite hormones. When it is out of balance, you may experience obesity-related problems like Chron’s disease or high blood pressure. To keep it healthy, you must avoid foods high in fat. The last of these life forces is Kapha Dosha, which controls your strength and growth rate. It also determines the health of your immune system, and your weight. Obesity issues may arise if Kapha Dosha is your life force. In all, practitioners base their therapies on the premise that it is important to maintain these doshas. Ayurveda is a viable, perhaps more comfortable alternative to clinical weight loss treatments. Before you can start using Ayurvedic remedies for weight loss, be aware of a few principles that you need to follow. The first, of course, is to know your dosha. As explained earlier, each person has a dosha with a unique blend of energies. Find out what yours is before you start using these remedies. You will then know if they will work for you. Another principle is that you must prepare your food with a passion. The effort and emotion you put into cooking it will determine its quality. If you love preparing lighter, less calorific meals, your weight loss journey will be less arduous. To keep your energies in harmony, eat the correct portions of food. Eat the heaviest meal of the day at lunch because you expend the most energy in the middle of the day. Eat light meals at dinner because this is when your metabolism begins to slow down. These medical treatments emphasize being one with nature. You will find many practitioners drinking herbal teas and using natural remedies. When you are in harmony with nature, you are in sync with your body. You will find it easier to lose weight. Further, do not eat leftovers if you use Ayurvedic treatments. It is important to eat food that is high in nutritional value when you are trying to lose weight. The nutrients in leftover food would have depleted, so consuming it would mean taking in empty calories. As an Ayurvedic practitioner, you should practice Panchakarma or cleansing. This process purges negative energy and toxins from your body. It includes drinking a lot of water and taking in Ayurvedic oils. Try Yoga, as it is part of Ayurveda. Both Ayurveda and Yoga were born of the same philosophy, so their principles complement each other. Both center the mind and keep the body fit. You will always be in good health if you follow the basic rationale of Ayurveda. Ayurveda is helpful if you want to treat weight gain the natural way. These natural therapies will bring about a slimmer you. Guggul is an unchallenged champion among Ayurvedic treatments. From the Commonphora Mukul tree, it helps bring your weight down quickly. It contains Guggulsterone, which supposedly aids thyroid functions, though researchers need more evidence to support this fact. The University of Pittsburgh Medical Center, however, found that it improves your mood and helps you drop weight fast. You usually measure the strength of a guggul extract by the guggulsterone in it. It is available at most health food stores. Gymnema will help you fit into that tight little LBD. It is an age-old herb that has appetite-suppressing glycosides. Users of this herb believe that chewing on it contributes to reducing sugar rushes. This wonder herb has properties that block sugar. Subjects of a Korean study found that they had fewer sugar cravings when they chewed on it. Evidence also proves that it slows the onset of diabetes, a weight-related condition. Supplementing your diet with Gymnema increases insulin production. Naturally, reduced sugar intake increases the possibility of weight loss. Another treatment, ginger, is famous among Ayurveda proponents for its weight loss properties. Besides being an anti-inflammatory agent, it relieves pressure on the gastrointestinal tract. It also facilitates digestion. With better digestion comes weight loss. Studies point out that it suppresses Cortisol, the compound that creates belly fat. Enjoy a cup of ginger tea, and lose weight as well. Many weight loss remedies focus on calorie burning, but Triphala is different. Much of the processed food we take in these days becomes stuck within our digestive tract. Triphala, a combination of three fruits-Amalaki, Bibhitaki, and Haritaki, cleanses the digestive system and helps you drop weight. You can take it in capsules or powder form. Curry powder, containing high amounts of curcumin, aids weight loss. A study by the USDA Agricultural Research Service found that rats which ate a high-fat diet gained less fat after taking curcumin. The magazine Biofactors also confirmed that it can help a person stay slim. Eating curry has weight loss benefits, but you must know the number of calories in it. They vary depending on the amount of coconut milk used. Garshana, or dry skin brushing, is a timeless weight loss solution. It hastens slow lymphatic flow and aids digestion too. You lose weight when your food breaks down. It rids your body of excess body fat as well. To perform it, massage all areas of your body, excluding inflamed or sensitive ones. Massage your joints with circular strokes. Strokes should always move towards your heart. Apply more pressure on areas with thin skin. Try these therapies and go to that party looking trim and fit. Note that you should always take Ayurvedic medicines under the supervision of a doctor. A few nasty side effects will occur otherwise. Doctors will advise if they interact well with the drugs that they prescribe you. One of the common problems of these medications is toxicity. The National Center for Complementary and Alternative Medicine found that some have high amounts of metal. Out of the 70 supplements they tested, 14 have high amounts of mercury and arsenic. You should not take these herbs if you are going through chemotherapy. Doctors at the World Health Organization have found that it interferes with anti-epileptic drugs as well. Lose weight the natural way with these treatments. Have you tried to find the fastest weight loss solution possible? You must have, at some point. You may have torn your hair out looking for one that works. The good news is that there now is. Meal replacement shakes are one of the fastest, most favored weight loss methods. They have been so for decades. Increasing health consciousness is making these miracle drinks even more attractive. A look at their ingredients will show why they are the best meal replacement shakes for weight loss. You will uncover the secrets behind their exceptional taste. Get to know why weight watchers the world over find them so satisfying. We will point out the best way to use these shakes to lose weight. You will want to know why this product is the right one for you, so we share its draws and flaws. What is the best meal replacement shake for weight loss? The best meal replacement shakes for weight loss are both tasty and efficient. They make weight loss fast but do so without neglecting nutrition. IdealShape shakes fits these descriptions to a T.
Packed with amazing nutrients, they are effective weight loss solutions. The array of flavors they come in delight taste buds as well. 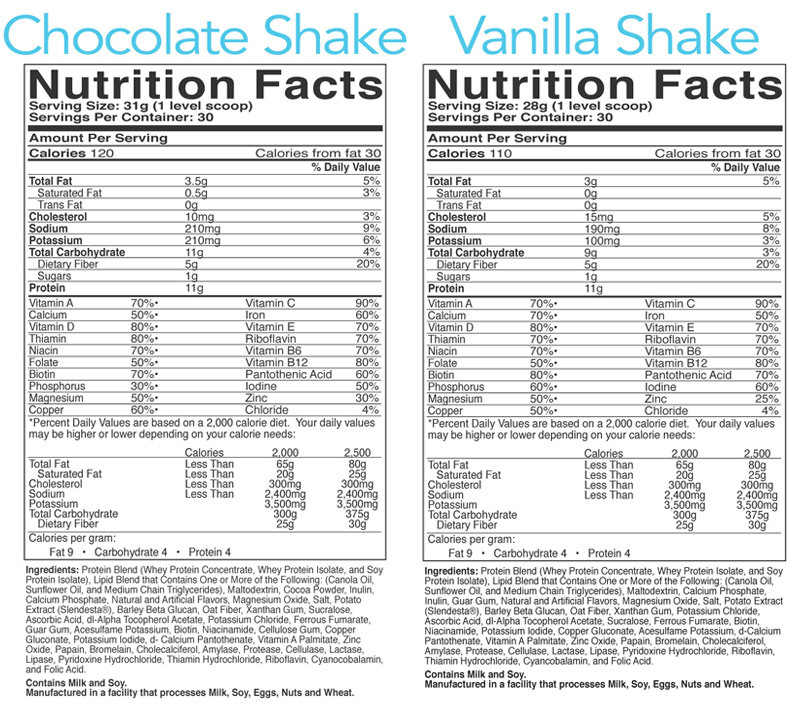 Before buying a meal replacement shake, you must find out which is the most effective. At a mere 100 calories per serving, IdealShape has one of the lowest calorie counts. Only 25-yes,25- of these calories are from fat. IdealShape shakes have high levels of protein. 29g, or 1 level scoop of this meal replacement powder contains 11g of protein. According to studies, protein is essential for weight loss. With roughly 1/3 of it made up of Ideal Shape protein, it is perfect for the task. That same amount has only 3 g of fat, with o.5 grams of it saturated. At only 20g, the amount of cholesterol in it is tiny. This astounding weight loss supplement has only 9 grams of carbohydrates. There are 21 wonder vitamins and minerals in IdealShape shakes that will boost your health today. Vitamin A: This essential vitamin improves eyesight and skin health. It boosts immunity as well. Calcium: Other than strengthening bones and teeth, this clever mineral enhances nerve communication. Vitamin D: This vitamin does wonders for the heart. It strengthens bones and immunity too. Vitamin B: Nerve cells and muscles function with the help of Vitamin B.
Niacin: Niacin keeps good cholesterol at a healthy level. Folate: Your mood may show tremendous improvement with the help of folate. Biotin: This mineral enhances the strength of nails and skin. Phosphorus: Phosphorus improves bone and muscle health. Magnesium: This functional substance strengthens the muscles and kidneys. Copper: Boost energy, blood flow and nerve functions with copper. Vitamin C: Present in the citrus fruits you love, Vitamin C increases immunity. Iron: Iron increases energy and promotes blood health. Vitamin E: Vitamin E gives the brain and liver the protection they need. Idealshakes have an incredible taste. You will not believe that that they help weight loss because they have a smooth texture. 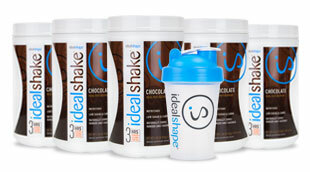 IdealShape Meal replacements are available in Strawberry, Chocolate, Mocha and Vanilla flavors. Surveys reveal that the positive reception to each profile is overwhelming. These delicious, low-carb meal replacement shakes are thin. You will not feel any heaviness. You may use flaxseed to add more body to your shakes if you prefer them thicker. They are chock full of nutrients, despite their thin texture. Most diet drinks use fiber to keep you full. IdealShape Shakes stand out from the rest. They use a mix of whey protein and fiber. These shakes keep you full with a powerful hunger blocker called Slendesta. Slendesta is a natural potato protein which you can find underneath a potato’s skin. It does not interfere with your metabolism, so you will not feel tense. It gets the body to produce cholecystokinin (CCK), which curbs hunger. Read an Ideal Shape review, and you will discover how mind-blowing Slendesta is. IdealShape Meal replacements keep dieters, who do not exercise, full for three whole hours. If you are a first-time dieter, you must have questions about what meals to replace. You will also want to know how to use IdealShape shakes so that your weight loss happens fast. IdealShape CEO Carla Meine addresses these concerns in a video. Carla reveals that the best way to start off is by drinking one a day. Then, increase that amount to two. Doing this helps your body to get used to the nutrients that are in these great weight loss solutions. She further suggests mixing the powder with 8 ounces of cold water. To give these already amazing shakes extra zing, add ice cubes to help them foam up. Mouth-watering Ideal Shape shakes recipes are available on carlameine.com. Add almost anything to these versatile products. They go well with berries, pears, and even spinach. The recipes include those for pre and post fitness sessions. Take these healthy drinks four or five times a day. 1. IdealShape shakes will keep you full for longer. This miracle shake will keep you full for a longer time than most of their weight loss counterparts. On average, an IdealShake curbs hunger for about four hours. 2. Ideal shake ingredients have a high protein quantity. These nutritious drinks have 11g of protein per serving. This astounding amount is more than in most meal replacement products. The number adds up to a whopping 22g of protein per meal. Whey protein will help men and women who want to build lean muscles. Ideal shape shakes are the best replacement shakes for male and female bodybuilders. 3. They are low in calories and sugar. These wonder shakes have just 1 g of sugar and 100 calories per serving. This amount is much smaller than in other weight loss drinks or smoothies. Pregnancy may cause mothers to gain post-natal weight. Idealshakes will help them drop that weight fast. They are the best replacement shakes for women who want to reclaim their figures. 4. These products come with a 30-day money back guarantee. Most people get a little dumbfounded when they see a 30-day risk-free guarantee on any product. IdealShape’s guarantee stands out because it is on a product for how much they believe it will work for you. Some Ideal Shape reviews reflected that Ideal shakes are too thin. But this can be an advantage. You can add almost any ingredient to these shakes, because of their thin consistency. These versatile drinks blend well with all kinds of ingredients. 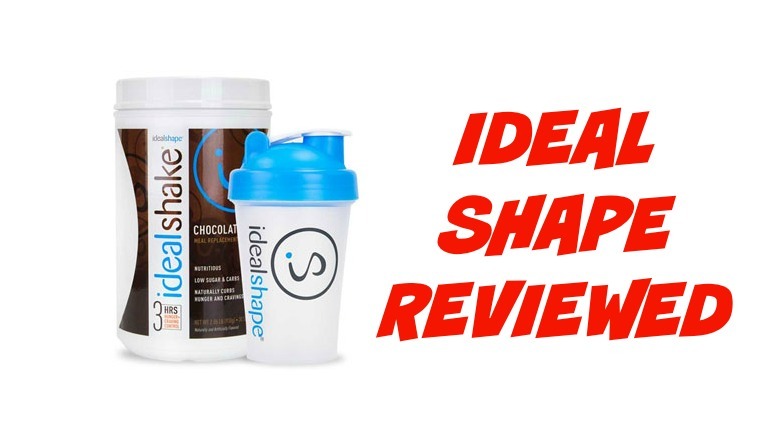 One word can describe the feedback on Ideal Shape meal replacement reviews: positive. People reported losing a healthy 5lbs within the first fortnight of drinking the shake. Of course, the effectiveness of every weight loss product depends on whether you exercise. IdealShape reviews show that those who did had faster weight loss than others. Its simple! You can buy Ideal Shakes from the for a discount via this page. These expert nutritionists have an impressive range of meal plans and bars available too. Mix these tasty, versatile shakes with just about any ingredient you can find in your fridge. You cannot doubt the quality of these shakes. IdealShape offers a confident 30-day money back guarantee. You have a whole month to decide if the products suit your needs. Return them after 30 days to get a full refund if they do not work for you. Make use of the Ideal Shape coupon and grab these life-changing products today. “Shake” your way to slimness with a product that will help. That uncomfortable, bloated feeling is not a welcomed one. No woman likes it. The digestive blues can hit you at the most inconvenient times. Probiotics, beneficial bacteria that cleanse the gastrointestinal tract, can be of help. 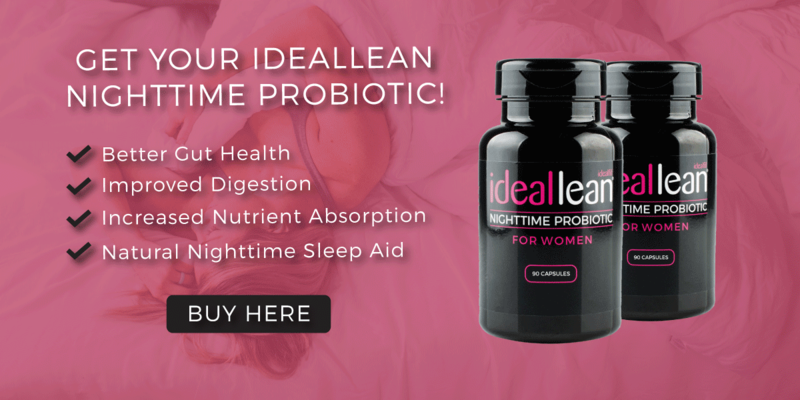 Introducing Ideal Lean Night-Probiotics, a winning blend guaranteed to keep you in the pink of digestive health. Read this Ideal Lean Probiotic Review to find out how life-changing gem will look after your gut, and you. See the lowest price here. 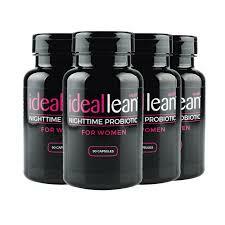 Probiotics like Ideal Lean Night Probiotic replace the beneficial gut bacteria that you lose. 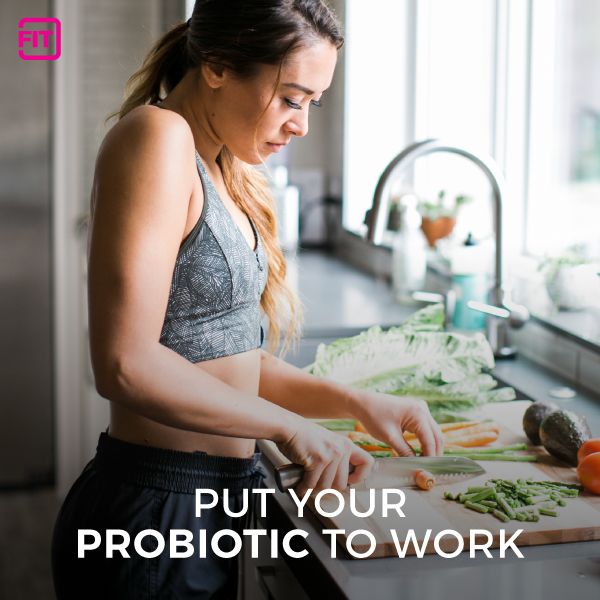 When you consume probiotic-rich foods such as yogurt and fermented cabbage, the healthy bacteria cultures in them move into your gastrointestinal tract. They then prevent harmful bacteria from taking over. It is wise to take probiotics after taking antibiotics because they replenish good bacteria. Potent Ideal Lean probiotics work to balance the good and bad bacteria in your stomach. They keep the body’s systems running at peak performance. You may think that probiotics are yet another new age health gimmick, but they have benefits that will surprise you. The 2012 American Heart Association report disclosed that Lactobacillus Reuteri found in meat and dairy products lowered LDL levels significantly. Researchers found that probiotics break down bile salts and prevent them from being reabsorbed into the gastrointestinal tract. Studies also found that the same bacteria kills the germs that cause tooth decay and gingivitis. According to the Harvard Medical School, consuming probiotics can reduce diarrhea and other digestive problems. A review published on the JAMA Network revealed that those who took probiotics were 42% less likely to experience diarrhea episodes than those who did not. Probiotics are a big boon for the human body’s immune system. A study in the Journal of Allergy and Clinical Immunology found that unborn babies were in better health when their mothers consumed probiotics. Some people may become ill every time the weather changes, but probiotics deal with that. Researchers who reviewed studies from the Cochrane Library discovered that they help to reduce bacteria in the upper respiratory tract. Probiotics are helpful for ladies. The unique Ideal Lean formula stands out above others because the company designed it with women in mind. If you are prone to yeast infections or bacterial vaginosis, probiotics will protect your sensitive area. Wander into any health food outlet and an array of probiotic supplements will greet you. They come in different forms, so which is the most beneficial? Probiotics most commonly come in capsule form. Freeze-dried probiotics do not need refrigeration if they are in properly sealed capsules. Those that are not in this form are sensitive to heat and moisture, so they require refrigeration. Note that Ideal Lean Probiotic, though in powder form, needs no refrigeration. Some probiotics come in the form of chewable tablets. Manufacturers design them for anyone who is not fond of swallowing pills, particularly children. The refrigerated section of health food stores may carry liquid probiotics, which some proponents claim are the freshest forms available. These can be a hassle if you travel frequently. Many Probiotics also come in liquid drinks, which may not be potent because other ingredients overwhelm them. Then, there are powders, which you can consume on their own or incorporate into dishes. So, which form is the best? A powder like the standout Ideal Lean blend is a winner because it is versatile. You can work it into delicious, low-fat recipes and not notice that you are taking it at all. With 32 billion CFUs, it cleanses your gut and is a boon for your digestive system. Unlike other probiotics, they can survive at room temperature. This probiotic blend is what you need if you want to give your digestion a boost. It improves the balance of good to bad bacteria in your body and fights off infection. Try it, and you will find yourself fitter than you ever were. The high fiber content ensures that you will maintain healthy fat levels naturally and safely. Use it to ease your worries if you have a tendency to be anxious; it is a natural sleep blend that works. What exactly does this A-plus formula contain? For a start, it has an incredible 32 million CFUs or Colony Forming Units. They measure how many health-giving bacteria there are in a supplement. Most supplement manufacturers indicate them proudly on their product labels. A first look tells you straightaway that Ideal Lean Nighttime Probiotic has more of them than other probiotic blends. With seven natural probiotic strains and healthy fiber, it ensures your gut health like few other supplements can. c. Lactobacillus Acidophilus, which improves digestive health and nutrient absorption. It also fights disease-bearing bacteria. d. Lactobacillus Fermentum, which generates the antioxidants needed to fight inflammation. f. Lactobacillus Rhamnosus, which will benefit your vaginal health immensely. g. Bifidobacterium Bifidum, which balances the amount of good and bad bacteria in your gut. 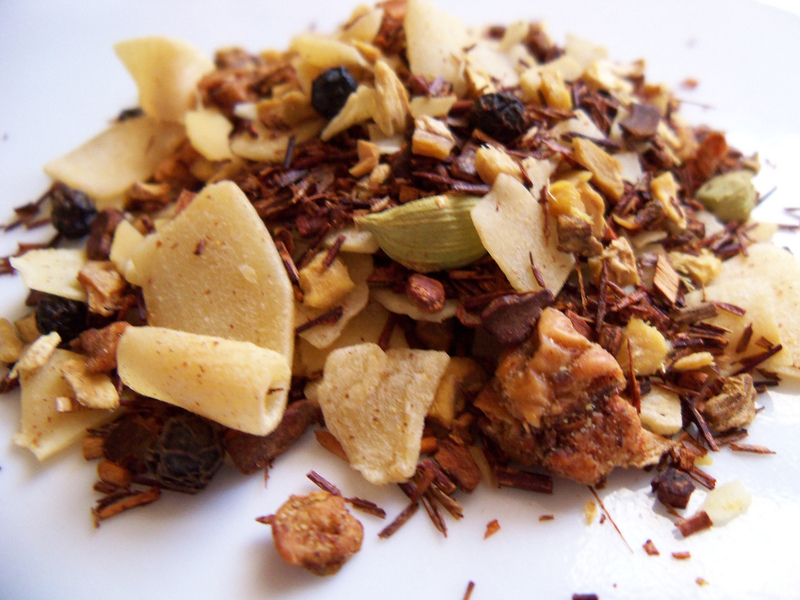 This one-of-a-kind concoction works for your body while you get your much-needed shuteye. The chamomile and valerian root n this natural sleep blend will calm your nerves and stop insomnia. 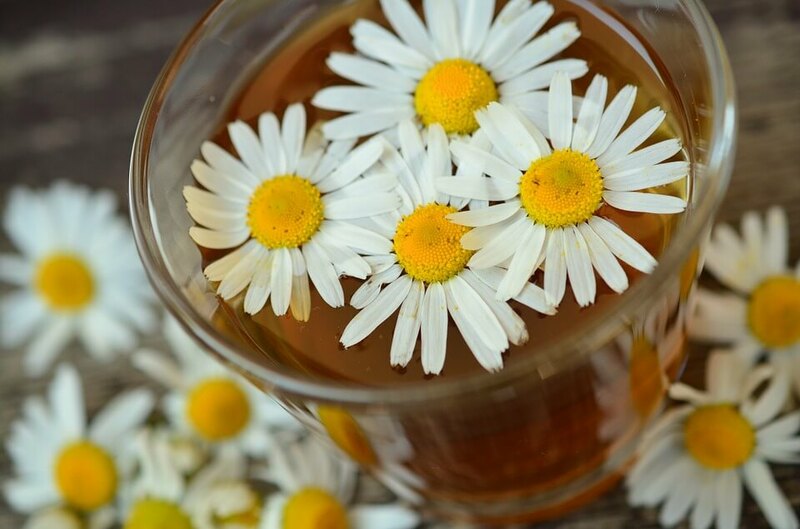 Chamomile, from the chamomile flower, treats skin conditions like psoriasis and eczema. 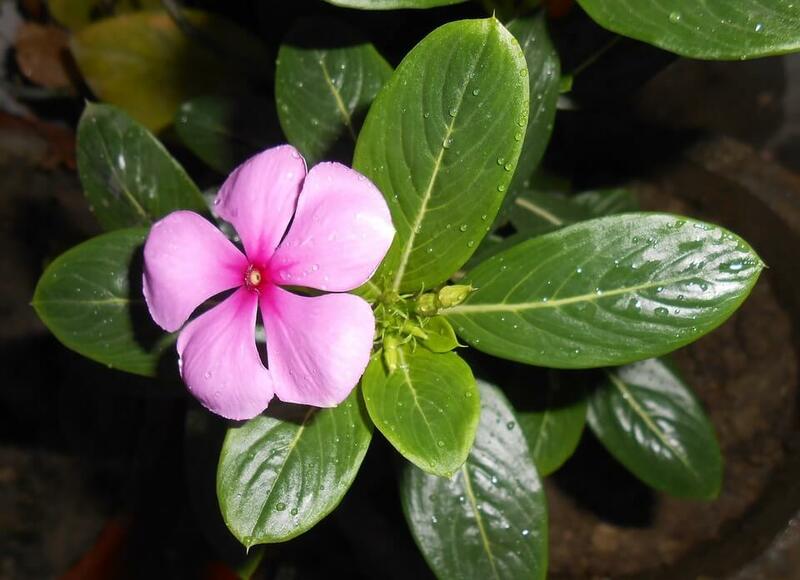 This versatile flower puts anxieties and stress to rest, giving you a good night’s sleep. Healing herbal extracts boost immunity and prevent infections. Dandelion Root supports the immune system and increases bile, which rids the body of toxins. Hawthorne Berry not only prevents inflammation but also slows glucose absorption. Horsetail extract helps to keep vaginal infections at bay. Fructooligosaccharides, or oligofructose, is an alternative sweetener which manages annoying hunger pangs. 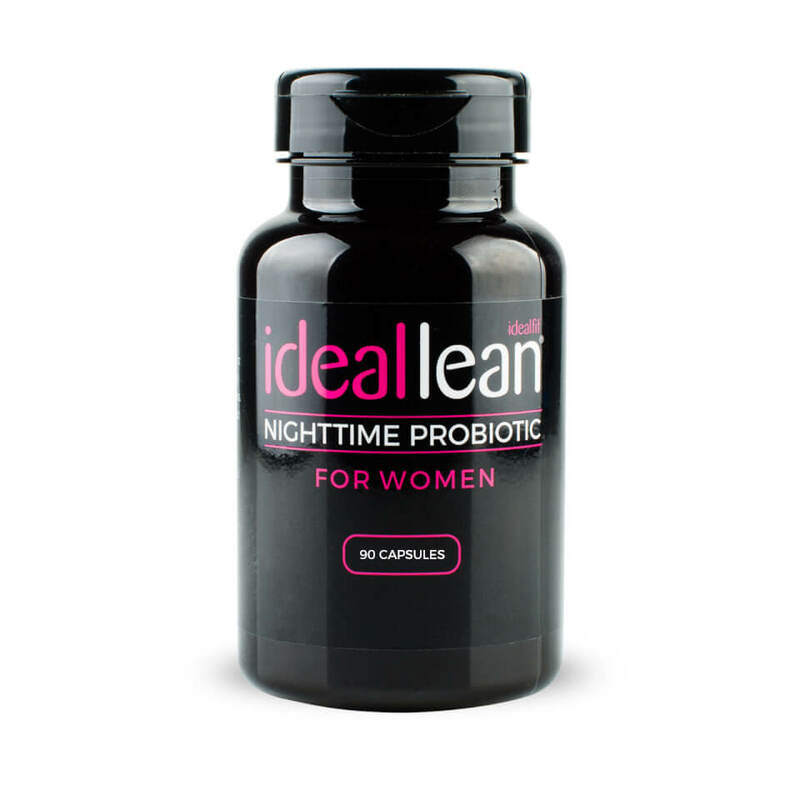 Why do You Need Ideal Lean Nighttime Probiotic? You need probiotics because your body houses healthy and harmful bacteria. Bad diet habits, characteristic of modern living, reduce good bacteria in the body. The absence of beneficial bacteria can lead to digestive problems. One of these is Irritable Bowel Syndrome or inflamed bowels. If you suffer from this, you will likely experience abdominal pain and an extreme fluctuation in bowel movements. You may alternate between bouts of diarrhea and constipation. Are you looking for weight loss solutions? IdealLean Nighttime formula will shape a slim, new you. This wonder product breaks down nutrients efficiently and helps you burn off excess fat. This unique blend contains a large 5 billion CFU of the L-gasseri probiotic strain, as well as six other types of healthy bacteria. According to a study by Cambridge University, the L-gasseri strain alone led to a 5% fat loss. The best time to take ideal Lean Probiotics is at night, just before bed. Since your digestive system slows down when you sleep, the probiotics will be most useful at that time. They will start working in your digestive tract immediately. If you want this one-of-kind blend to deliver optimum results, do not take it with food. Food raises the acidity of the stomach and destroys the probiotics before they have a chance to work. Consume them at least two hours after dinner. The environment of the colon, where probiotics thrive, is usually between 6.7 and 6.9. The gut needs to become more acidic to nurture them. Probiotics make the colon more acidic and turn it into a more hospitable environment for them. The change in the gastrointestinal environment may cause you to experience gas, loose stools, and other minor bowel problems. These effects are negligible with the breakthrough IdealLean blend. Further, the valerian and chamomile ingredients will calm you without making you feel drowsy. This product works so well for women that Ideal Fit has taken the risk of buying it upon itself for a whole year. If it does not improve your digestion, just return it with a year to get every cent of what you paid for it. If you want to experience the effects of one of the best probiotic blends on the market, get the genuine product from the Ideal Fit website. Click the buy button today, and receive it in no time at all. If you are a woman looking for weight loss and a way to improve your digestive health, you have found the keys to them. Click on the order button today, and witness Ideal Lean make improvements beyond your imagination.